Advertising of any product or service is the most important thing a business requires to do in order to let people be aware of the brand and avail them. With the increasing popularity of online marketing, the World Wide Web provides a robust platform for business promotion. Besides getting the links naturally through search engine optimization (SEO), pay-per-click is the way to drive maximum traffic and boost sales and profits. Regardless of the size of business and nature of its products or services, paid search campaign is one of the fastest ways to highlight the brand and attract a maximum number of target customers. Google AdWords being the largest advertising display network offers various tools for businesses to display their products and make a buzz in the market. Planning, creating and managing AdWords campaign is a full time and complex process. Getting significant benefits from it require that you hire a team of certified experts or Outsource PPC services to a renowned and experienced digital marketing company. Managers of many start-ups often face this dilemma and they find it difficult to resolve the issue. Whether you consider recruiting a team of in-house PPC experts or outsource this to a reputable company, you should consider and compare the cost, performance and benefits of paid search campaigns by both the ways. When you hire an in-house team, you need to spend a considerable part of your budget on recruiting certified AdWords expert as well as cost on maintenance of the infrastructure. Based on your budget and advertising goals you can select the more affordable option that can be in-house or PPC outsourcing to a top-notch agency. Hiring inexperienced people can lead to a series of expensive mistakes. This would not only drain your budget but also lead your competitor to get ahead. If you are the manager of a start-up company and looking for guaranteed results, then it is best to outsource the PPC services to a company that has a wealth of experiences and enjoys a sound reputation. This will facilitate you gain leverage from the expertise of people with proven credentials. This will save your time and money and you can focus on other core activities. It is simply not enough to set up a PPC account and develop an effective PPC campaign. You would require doing an intensive research of your target customers’ preferences, your competitors and keywords, analyze the results, and bring about necessary modifications in order to optimize the campaign. Outsourcing helps you rest assured that your PPC campaign is in the right hands and there are experts to monitor and audit your campaign to bring maximum ROI to your business. 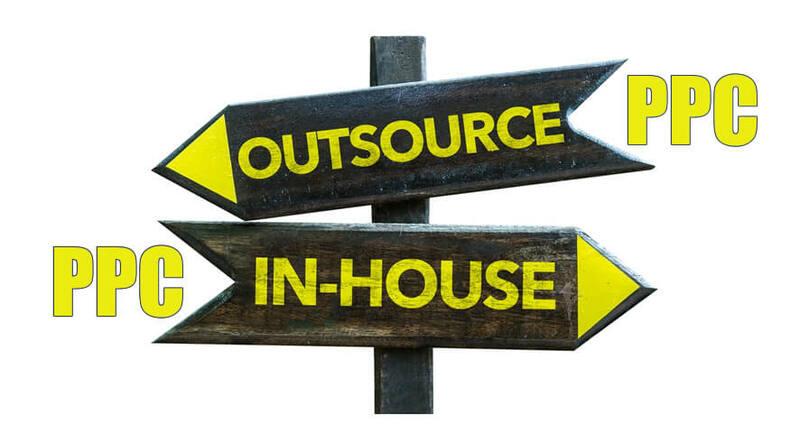 Considering a third option that is a combination of both; the in-house, as well as outsourcing, would minimize the risks and offer your business the dynamic flexibility. In case any employee of your in-house team falls sick or resigns unexpectedly then you can outsource PPC management to another company. This would not hamper your progress or affect the result in any way and you will be saved from a lot of trouble. So make it a point to analyze all factors, decide for the most suitable solution that would lower your cost on paid search campaign, and streamline business promotion.